When I was growing up in the 1980's we had a rotary dial phone. You put your finger in a numbered spot on a circular dialer which clicked as it returned to its place and registered the 7 or 10 numbers you selected. It took a full 10 to 20 seconds to complete a call and was really annoying if the number had a lot of 8s or 9s! Then came touch-tone phones. You pushed a button, it beeped, and you could make a call in two and a half to three seconds. Back in those days, a phone was simply an instrument to talk with someone voice to voice. Nowadays, phones are "smarter"; they are "smart" phones; and they do everything even start your coffee maker before you wake up. You can send or receive emails, text, Facebook, "Skype", play games, study languages, listen to music, record love letters, pay your bills, watch movies...your phone can be the interface for your life, and it is, for many people! These days when you get a phone -- a "smart phone", the first thing you do is to find the best “apps” for it. Thousands and thousands of apps are available, with more being created every 5 minutes. Your apps define the interface of your life. Let us think about it in a little different way. 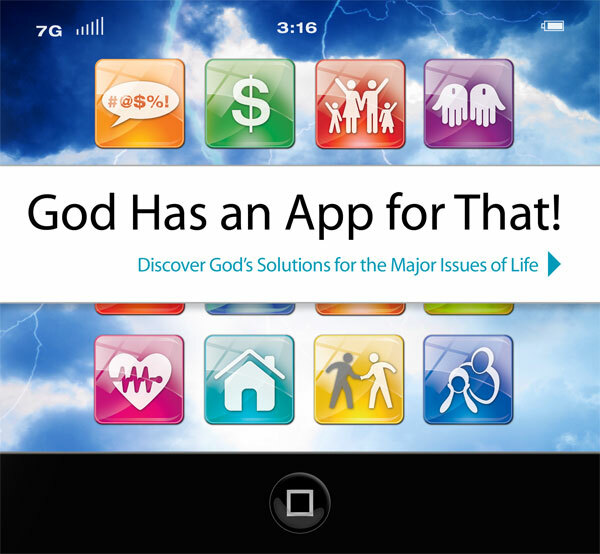 ...there's God apps... throughout the Scriptures, and they're FREE -- thousands of them, every one "GUARANTEED" to be a top-level "interface" for your life! Check out the love app! [Matthew 22:37-39] Or the Spiritual Fruit App! [Galatians 5:22-23] Or the Unity App! [Ephesians 4:2-6] The Scriptures are just filled with apps to apply to the interface of your life! 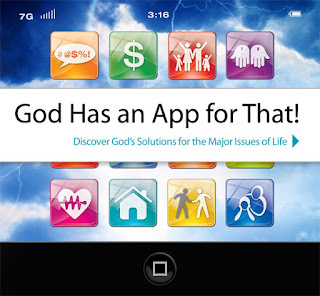 Spend some time in God's free "App Store" today, it's just an opened Bible away! Apply God's apps to your life -- you'll be dialing into His will, purposes, power, and His infinitely interesting universe! Dear Lord, we thank You for the opportunity we have to come to Your App Store. Help us to dial into Your will with the many apps You have for us. In the Name of Jesus, Amen.